Gets or sets a collection of Double values that indicates the pattern of dashes and gaps that is used to outline shapes. A collection of Double values that specifies the pattern of dashes and gaps. These examples show the effects of different StrokeDashArray values applied to Lines and an Ellipse. <Ellipse Height="60" Width="360" Stroke="Black" StrokeThickness="4"
A valid strokeDashString for the StrokeDashArray property describes a repeating pattern of strokes and gaps. Each Double in the collection specifies the length of a dash or gap relative to the Thickness of the pen. For example, a value of 1 creates a dash or gap that has the same length as the thickness of the pen (a square). You can use a space, a comma, or a mixture of both as the separator. Because the pattern repeats, StrokeDashArray="1" has the same result as StrokeDashArray="1 1". 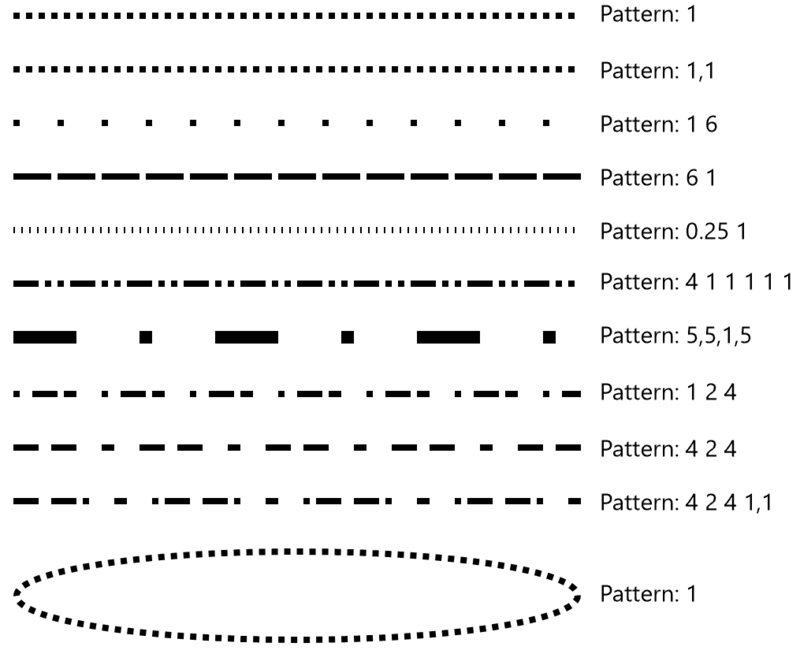 If the collection has an odd number of values, the pattern alternates between starting with a stroke and starting with a gap, as shown in the examples. You should typically use integral numeric values. Non-integral values can cause subpixel rendering and may alter the apparent color of the stroke.